Stations of Havasu Creek in astrogeography. On the astrology of rivers, magical places and breathtakingly beautiful nature: the astrogeographical position of its source, the Supai settlement, the Navajo, Havasu and Beaver Falls and the conck´luence of Havasu Creek confluence into Colorado River. 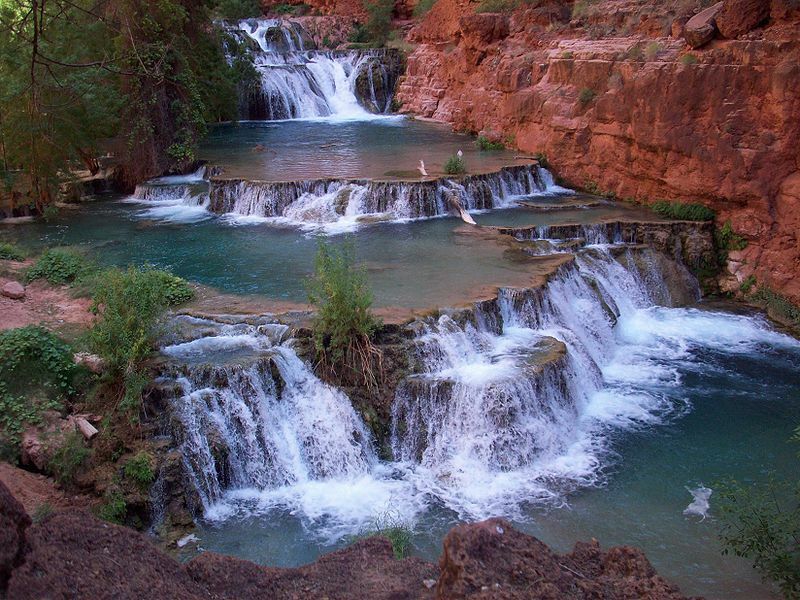 Havasu Creek in Arizona associated with the Havasupai people is a 15 km long tributary to the Colorado River. It`s source lies at 994 m altitude from where it flows in a north western direction entering in the Grand Canyon at 547 m.
Astrogeographic position of the whole lenght of Havasu Creek for morphogenetic field level 2 (city) which describes the atmosphere and energetical topics of the whole course of the river bed: the upper part in Aries – lower halkf in Piaces – the coordinate of the astrogeographical latitude leads from 8° in dynamic, male fire sign Aries sign of action, speed, warfare to 12° in highly relaxed mystic, spiritual water sign Pisces sign of the dream world, fairy tales, entertainment, music, temples and the reconnection with the spiritual plane. 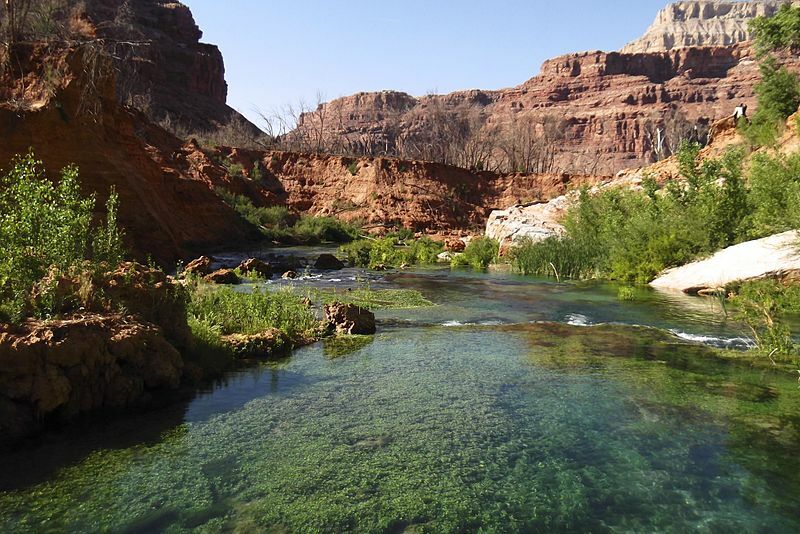 The coordinates for the astrgeographical longitude of Havasu Creek stretch from 4° Pisces at the spring to 22° air sign Aquarius the sign of the sky, self-finding, paradise at the confluence with Colorado river. For a spiritual journey it is therefore recommended that hikers might see the trip upstream as a walk de´dicated to visions quests and to self-finding (from Aquarius into Pisces) and the return back downstream as a hike dedicated to self-healing and letting go of the past, and to the grounding of the spiritual vision (from Pisces into Aquarius). Astrogeographic position of the site of the source of Havasu Creek for morphogenetic field level 4 (exact position) which describes the atmosphere and energetical topics of the birth place of the river: one coordinate of the birth place is in the mother sign of rivers: emotional water sign Cancer the sign of the moon, motherhood, the uterus, sources, fertility, pregnancy and the sign of early childhood. The second coordinate lies in creative, innovative, spiritual air sign Aquarius the sign of the sky, heaven, paradise, self-finding and the natural resonator for the light blue colour of the water. 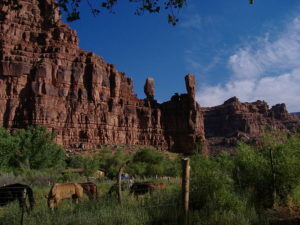 Astrogeographic position of the site of the settlement of Supai for morphogenetic field level 3 (surrounding area) which describes the atmosphere and energetical topics of the 700 m long 500 m wide space in the canyon where the settlement is located: both astrogeographical coordinates are located in solid, fixed earth sign Taurus sign or the earth, grounding, growing roots, agriculture, food, cows, cattles, town centers and market places. 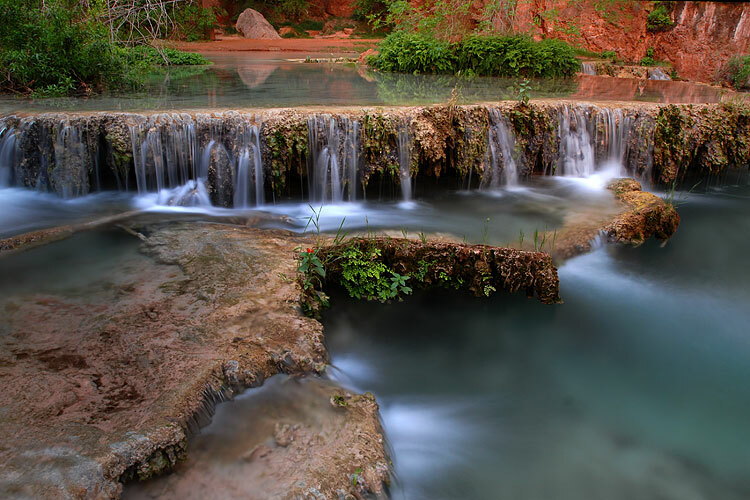 Taurus is a strong indication and a natural stabilizing factor for the only location big enough for a settlement and some form of agriculture along the otherwise narrow canyons of Havasu Creek. Taurus is the resonator for the places of foundation of towns. Astrogeographic position of the site of the New Navajo Falls for morphogenetic field level 4 (exact position) which describes the atmosphere and energetical topics of the falls itself: the new falls developed right on the divide bwteen highly energetic, energetic royal fire sign Leo sign of the sun, light, heart and electric power stations and the intensity of the energy and electric power set free by waterfalls and self-protective earth sign Virgo sign of spiritual entities of plants and indicator for the importance of the chance for the development of new plant growth at the new site of the river bed. The 2nd coordinate is right next to the cardinal divide between Virgo and air sign Libra sign of harmony, balance, symmetry and angels. The new position near the cardinal divide indicates that the new falls mark an adaptation to a shift in the energetical field structure of the larger area. 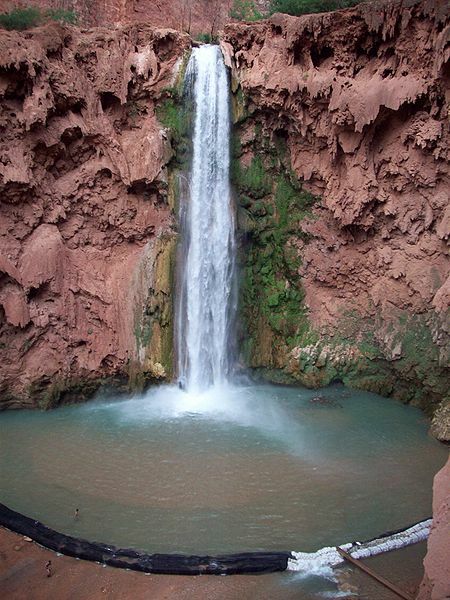 Astrogeographic position of the site of the Havasu Falls for morphogenetic field level 4 (exact position) which describes the atmosphere and energetical topics of the falls itself: one coordinate is in highly energetic, magnetic royal fire sign Leo the sign of the sun, light, heart and electric power stations. 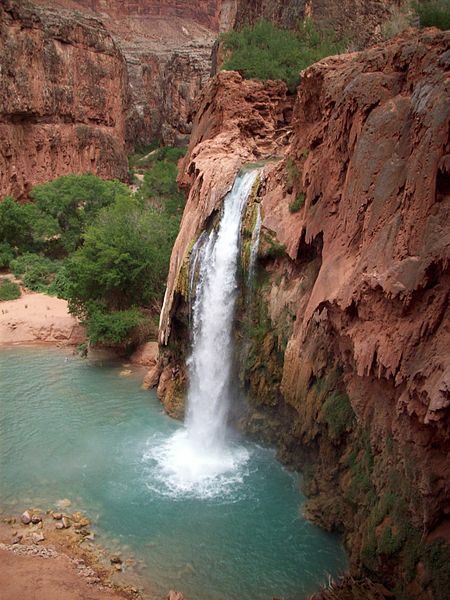 Leo resonates with the intensity of the energy and electric power set free by waterfalls. The 2nd coordinate lies in solid, fixed water sign Scorpio sign of harder rock material. Through its relation to containers and caves Scorpio resonates with the basin below the water fall. 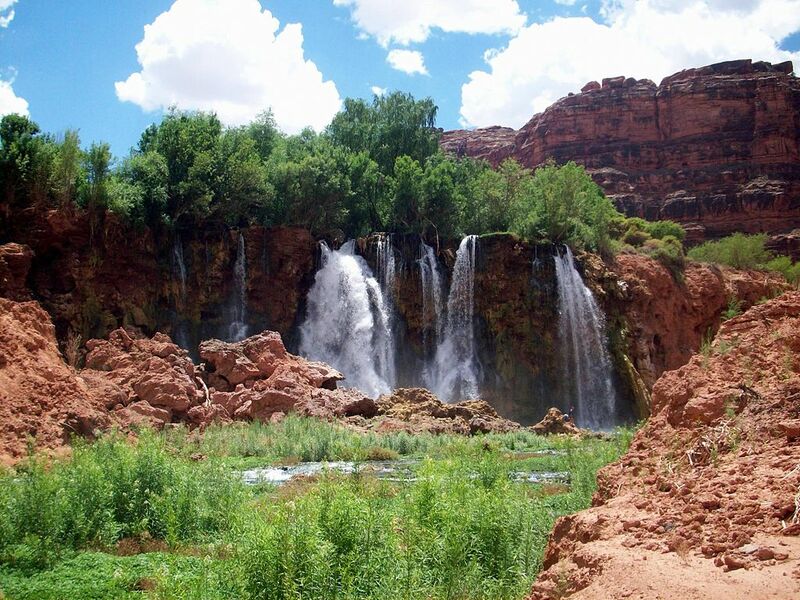 Next step down the river from Havasu Falls ar Mooney Falls. Astrogeographic position of the site of the Mooney Falls for morphogenetic field level 4 (exact position) which describes the atmosphere and energetical topics of the falls itself: Both coordinates are near the cardinal divides of the spring and autumn equinoxes thus pointing at the site as a place of the resonance of a passage between weather divdes and an important divide between different morphogenetic fields of resonance in the larger area and region. One coordinate is near 0°in unicellular, one-dimensional, dynamic, male fire Aries sign of action, speed, warfare, ignition and the other near 0° in service-orientated female air sign Libra sign of relationship, openness, gates, harmony, balance, beauty. Astrogeographic position of the site of theBeaver Falls for morphogenetic field level 4 (exact position) which describes the atmosphere and energetical topics of the falls itself: one coordinate is located in solid, consolidating earth sign Capricorn sign of rocks, mountains, hierarchy, altitude, control, impediments, walls and indicator for the resonance of topics that have to do with obstacles and passing diffences of altitude. The 2nd coordinate is in highly energetic, magnetic royal fire sign Leo the sign of the sun, light, heart and electric power stations. Leo resonates with the intensity of the energy and electric power set free by waterfalls.